Each procedure is tailored to the nature of the defect. The smallest defects can be reconstructed using a non-overlapping Z plasty technique. The larger stretched defects or larger tears may require alternative flap repairs, for example a W plasty. It is possible to get the ear repierced approximately three months after the repair is performed. This surgery also attracts rebates both from Medicare and private health funds. 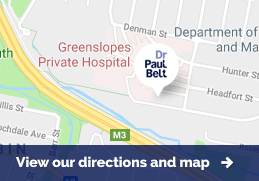 Dr Belt will be happy to advise which procedure will be suitable for your particular condition.